In this module, please enter Scrip name, quantity, rate and amount of the securities held by you as trading stock (other than stock held as investments) held at the start of the current financial year. The date of purchase, distinctive nos. Etc . are not required as there is no need to calculate the long-term or short-term gain on this stock. The opening stock of securities must be marked as demat delivery with DP Name to get the correct status of demat holdings, otherwise the stock will be assumed as physical. You can import opening stock from excel file. Scrip Name Select scrip from list. D.P. Name Select demat account from list. Market Select market of opening stock. Purchase Date Enter purchase date of opening stock. Amount Auto calculate column by rate and qty. Close (Button) Click here for close without save detail. 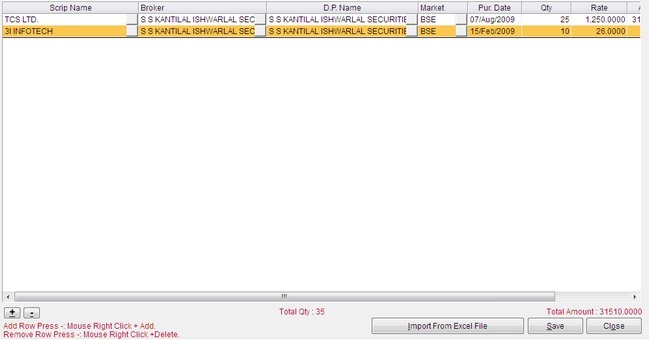 Import From File Click here to import opening stock transaction from excel file.